Whether you need Hydraulically applied Erosion Control Products (HECPs), topsoil/compost alternative or soil amendment specifications, Erosion Control Specs has the most up-to-date and customizable specifications available in this free and intuitive site. 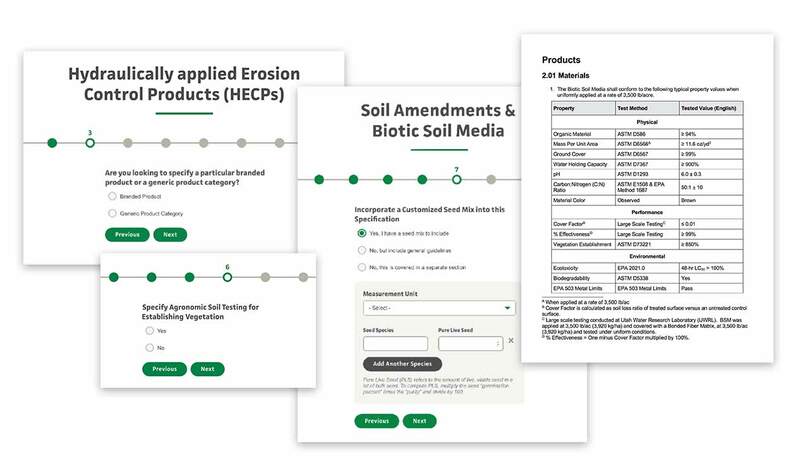 Get started by selecting the "Build Now" button below and follow the step-by-step prompts to build your perfect erosion control/revegetation product specification packages. When you're finished, you'll have instant access to your complete documentation in an editable Word file. If you already know what you’re looking for, utilize the industry’s most comprehensive list of erosion control product specifications. Here you can learn more about products and view some of the most common characteristics that can provide guidance for basic product recommendations.